When it comes to dressing up, say it is a wedding or a fancy dinner; your hair is one of your biggest accessories. I’m always crunched for time and hardly ever have time to run to the hair salon (plus I also don’t want to spend the money either). Here’s a super easy updo that anyone can recreate at home, especially if you’re not great at doing your hair (like myself). It was inspired by an updo I saw on Jessica Alba and looks like it took a lot more work. It only takes a few minutes and a few simple items like a brush, bobby pins, hair spray, curing iron and Goody hair elastic. Best of all, Target is offering FREE Goody hair elastics when you buy U by Kotex, which are two things I refuse to run out of! That’s why this offer is so great. p.s. be sure to text “KOTEX” to “TARGET” (827438) to get your coupon! Here are the easy steps to get this look…. 1. Start by creating a deep side part (you can choose which side you like best). I also find that second day hair works best. 2. Set aside a small section of hair (approximately 3 fingers wide of hair). You will use this piece later on in the hairstyle. 3. Comb your hair into a low side ponytail and secure with a Goody hair elastic. You want to make sure this is tight. 4. Next, twist your hair and wrap it around in a circle into a low bun, and secure with another Goody hair elastic (wrapping the elastic about once or twice). 5. Then pin the bun with bobby pins to secure. 6. Once your bun is in place, grab the small section of hair and curl it with a curling iron. I like to use a 1 ½ inch barrel from Hot Tools and wrap the hair around the barrel (not the clamp). 7. Once the hair is curled, use bobby pins to secure the strands next to the bun…you want to go for a messy look, so you can play around with this part. It doesn’t have to be perfect. 8. Finish off by spraying hair spray. I like using Sebastian, it’s easy to brush and won’t leave white flakes. And there you have it…. 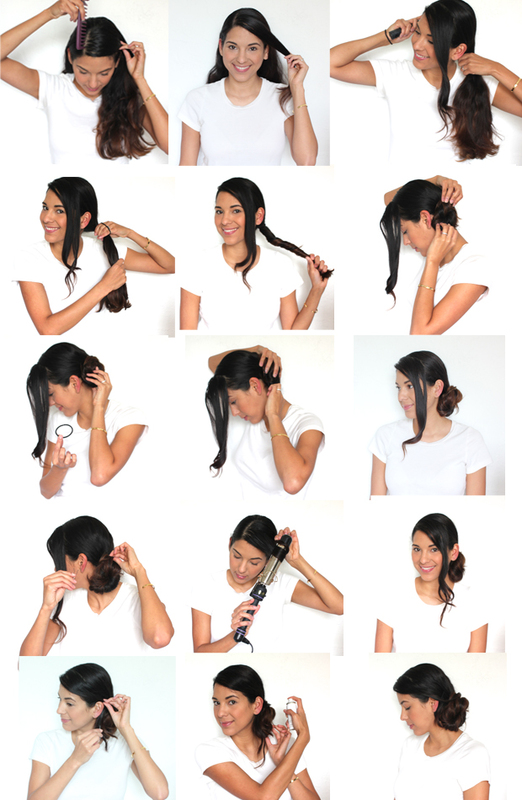 an easy updo in just a few simple steps!